Fresh Pond has been found to have high levels of phosphorus requiring it to be labeled “impaired waters” by New York State. This had come as news when Shelter Island’s Watershed Management Plan (WMP), a scientific study of the town’s surface water bodies — bays, creeks, harbors and ponds — was presented to the Town Board Friday. Resident Emory Breiner asked Lara Urbat, an environmental scientist with Nelson, Pope & Voorhis, the environmental engineering company that conducted the study, to repeat that Fresh Pond was an impaired water body and Ms. Urbat confirmed it. “I had not realized it had been added to the impaired list,” Ms. Dowd said. Earlier she had said the phosphorus might have found its way into the pond from dishwasher or laundry soap. “That was prior until a couple of years ago when all soaps contained phosphorus,” Ms. Urbat said. 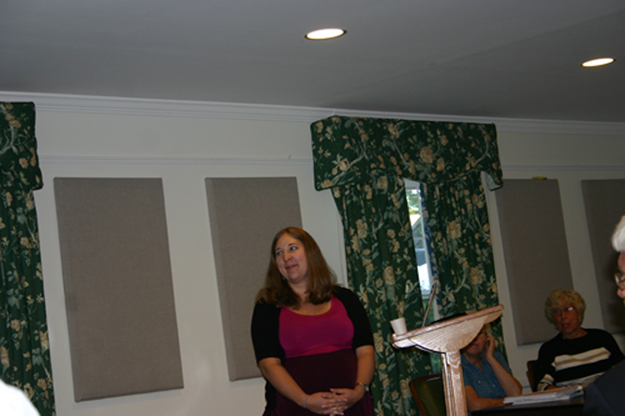 Asked what the consequences of the high levels of phosphorus would be, Ms. Urbat said harmful algal blooms could occur. Councilman Paul Shepherd asked if blue-green algae could be occurring and Ms. Urbat said it was possible. Human exposure to blue algae results in the symptoms of poisoning, including diarrhea, vomiting and high fever. Funded by New York State to conform to the Federal Clean Water Act, the goal of mandated watershed management plans is to improve surface water in the state’s municipalities. The Town Board has scheduled a public hearing on the Watershed Management Plan for Tuesday at 1 p.m.
JULIE LANE PHOTO | Water Advisory Council Chairman John Hallman (the sign notwithstanding) warned at Monday’s meeting that those arguing against a ban on irrigation systems could, years from now, be plagued by no drinkable water. If not today or tomorrow, but perhaps 30 years from now, that ancient verse could be the plight for Shelter Islanders in the most sensitive areas to the south along the coastline, according to John Hallman, chairman of the town’s Water Advisory Council. Those most opposed to implementing a ban on automatic underground irrigation system, Mr. Hallman said at Monday night’s WAC meeting, are the ones who would be most affected by a drought down the road, with no potable water in their wells. “The people bitching the most are those who can least afford to do so,” he said, referring to speakers who argued their green lawns were vital to maintaining the ambiance on Shelter Island. All test wells on Shelter Island showed a drop in capacity for August “which is normal for the end of the summer,” Mr. Hallman said. He speculated that September numbers might show a further drop. Any area with well reading of less that 2 feet shouldn’t be allowed to do any irrigation, Mr. Hallman said. “Thank God these numbers are August and not May or June,” Mr. Hallman said about the latest test well readings. “Hopefully we’ll get some rain” in October and November, he said. He will be joining fellow WAC member Walter Richards and six others on a newly appointed town Irrigation Committee that begins meetings Thursday night. The committee is likely to continue its meetings at least through December, according to Supervisor Jim s, who serves as liaison to the WAC. In July, the Town Board approved a moratorium on the irrigation ban that was originally slated to go into effect September 1. When the Town Board approved the moratorium, Mr. Dougherty said it could be nine months before a decision is reached about whether or not to implement the ban. The committee will be working with a consultant to explore issues such as whether irrigation technology has improved since the ban was first proposed in 2003. At that time, residents were banned from installing new irrigation systems, but those who already had them were allowed to continue their use for 10 years. COURTESY PHOTO | The town is paddling forward on issues left unresolved in 2012. 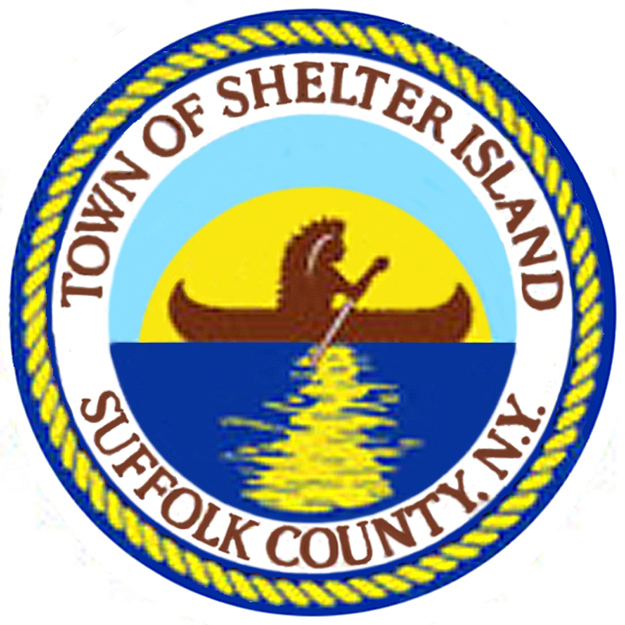 Shelter Island powers-that-be successfully tackled a number of issues in 2012, but there are still pending issues left on the table, and various boards have full plates for 2013. • An effort by fire commissioners and department brass to usher in a spirit of cooperation in the new year. It’s been 10 years since a previous Town Board passed a resolution that would ban use of all underground irrigation systems not connected to private cisterns, but delaying implementation until the fall of 2013. There’s no active move to repeal the ban, but some have expressed doubts about its necessity. Water Advisory Council member Walter Richards told his colleagues last fall he thought the 2003 Town Board did its job in limiting the use of automatic underground irrigation systems. Still, he wondered if the ban, intended to protect the Island’s sole-source aquifer, was the wisest course of action. He asked for more scientific data for the WAC to rely on in giving any advice to the Town Board on whether to actually implement the ban or remove it from the calender. He also said he was concerned about how the ban might be enforced. There are 128 legally licensed underground irrigation systems installed on the Island and about 20 that have no town license, according to Supervisor Jim Dougherty. Most are installed in “the most vulnerable areas” of the Island where drought can lead to saltwater intrusion and wells that fail to deliver potable water, Mr. Dougherty said. Without inspections, there’s no way to assure that cisterns are being properly used and that they’re doing the job in terms of avoiding the use of groundwater to irrigate lawns and gardens, Mr. Richards said. Mr. Dougherty, the Town Board’s liaison to the WAC, agreed that the 2003 Town Board — which acted at a time of severe drought and a falling groundwater level — was “visionary in doing what they did.” The current board, he added, is trying to make sure the Island’s water supply remains adequate. He has been meeting with hydrologist Drew Bennett and offered to include members of the WAC in those meetings. 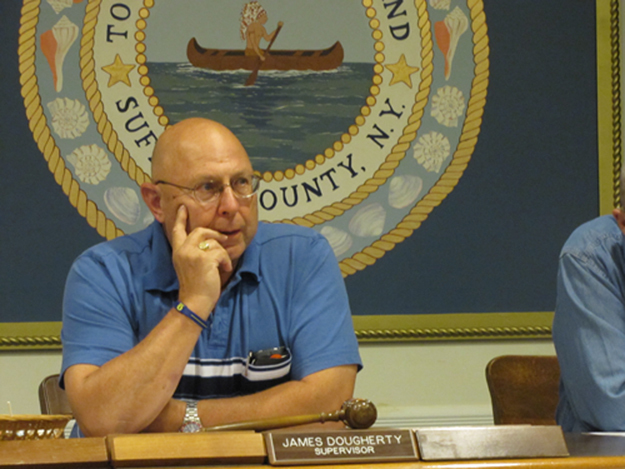 The supervisor said he wants to assure that the Town Board is ready by spring to begin a campaign to remind residents and business owners of the pending ban set to take effect in September. According to the town code, no permits for new irrigation systems were allowed after the Town Board banned them in 2003, except systems with cisterns fed by off-Island water. All such legally permitted irrigation systems, including those without cisterns that pre-dated the 2003 law, have been allowed to continue in operation to allow owners to amortize their investments. But as of September 1, 2013, no underground irrigation system is allowed except those that were permitted under the 2003 cistern rule. A draft report written by WAC chairman John Hallman dealing with the planned ban wasn’t made public last fall, but was distributed to WAC members who were invited to comment on it. Members can be expected to make their comments public this winter. A special committee of Town Board and Planning and Zoning Board members is looking at two over arching zoning issues that could bring changes in 2013. The committee is expected to make recommendations to the Town Board that could affect building on properties owned by nonprofits, such as Mashomack Preserve and Sylvester Manor. The other subject being examined is whether special zoning should be provided on land that makes up family compounds. In November, the Town Board granted the Nature Conservancy, which runs the Preserve, permission to install an additional house for staff members while stipulating there’s a distinction between a public property and a privately owned parcel. New legislation, if implemented, would be designed to establish a standing distinction between public and individually owned properties to avoid forcing these lots to be subdivided to accommodate additional structures. The legislation could also apply to the Perlman Music Center and the Passionist Fathers St. Gabe’s Retreat Center. Related to the nonprofit land structures is the question of how to handle family compounds where owners might have the space, but not automatic zoning clearance to build more than one house. The committee will consider whether to recommend that such properties be considered on an individual basis by the Zoning Board of Appeals or be allowed a specific number of houses based on the size of the lot, or other criteria. Whatever the special committee recommends, it would fall to the Town Board to make final decisions about what to implement. The December 14 mass shooting at a Connecticut school weighs heavily on the minds of everyone in the community. Educators and Board of Education members are working with Police Chief Jim Read, to continue struggling with ways to tighten methods for handling visitors to the campus. It has long been a requirement that all school doors be locked during the day with only the lobby door, attended by a staff member, open for anyone who needs to access the building. But prior to the Christmas break, another step was put in place, using an aide to accompany visitors from the lobby to their destinations within the building. Other steps that might be implemented remain a subject for discussion, according to Superintendent Michael Hynes. While safety and security are paramount, that’s not the only issue as the district starts a new year. Dr. Hynes and academic administrator Jennifer Rylott are working to implement a new state-mandated educator evaluation system aimed at maximizing teachers’ skills to assure that students are getting the best preparation possible to compete for college placements and jobs. Shelter Island teachers have embraced the effort with Teachers Union president Brian Becker pointing out that his members were very much involved with the implementation of the program here. Another initiative under way is the creation of the school’s Athletes Hall of Fame. A committee of educators and community members is at work collecting nominations for the first group of inductees of former athletes, coaches and others whose sports-related activities have reflected positively on the community. The inductees will be honored with plaques and other sports memorabilia to be displayed in the hallway outside the school gymnasium. The Shelter Island Fire District initiates a new year tonight, Thursday, January 3, with a 7 p.m. reorganization meeting at the Center Firehouse. While the meeting will focus on selection of a chairman of the Board of Fire Commissioners and various routine appointments, what’s critical is how commissioners and fire department brass mend a rift that boiled over in December. At its December meeting, commission chairman Richard Surozenski called on everyone to work together in a spirit of cooperation. Fire Chief John D’Amato ended 2012 presenting commissioners with a 10-point list of issues he said he considers critical in the year ahead. They include efforts to become compliant with federal Occupational Safety and Health Administration requirements; training for firefighters; repair of the Center Firehouse’s auto generator switch; completion of radio upgrades; and establishment of a long-range budgeting process. Issues concerning how to handle disciplinary procedures within the department got some attention toward to the end of the year as did the commissioners’ effort to define who is authorized to speak publicly on various matters. A new policy for handling disciplinary procedures was defined in December to authorize action by the chief pending a meeting of the commissioners who, in most cases, would be inclined to uphold the chief’s recommendations, according to Mr. Surozenski. As for the policy on public comments, any issue involving both the fire district and department should be addressed by representatives of both units together, according to the policy. Issues germane to only one of the entities can be addressed by a spokesman for that entity. But how that policy might play out in the year ahead remains to be seen since there has been no practice of calling a joint news conference and representatives of the district and department have been interviewed separately on various issues.